A pedestrian has been seriously injured after being involved in a collision with a motorbike in Cliftonville. Police were called to Northdown Road just after 2:30pm this afternoon. Officers are currently at the scene along with South East Coast Ambulance Service and the pedestrian is reported to have sustained serious injuries. The motorbike driver and a pillion passenger also received injuries. Two people have been arrested in connection with this incident. There are road closures in place from Northumberland Avenue between the junctions of Rutland Avenue and Northdown Park Road and also from Northdown Road with the junctions of Prince’s Gardens and Leicester Avenue. Officers would like to talk to anyone who may have seen a black, silver and yellow Honda CBR being driven in the area. A balloon has been found to be the cause of a light aircraft crash at Herne Bay's airshow in Kent. According to the Air Accidents Investigation Branch it became lodged in its engine at last year's event, forcing the pilot to ditch the plane at sea. The pilot managed to avoid both spectators and swimmers. Spectators waded in to the water to help the pilot who was face down in the water. Safety action has been taken to prevent similar incidents in the future. The family of a mother who died after a car crash have paid tribute to her. Clare Smith died in hospital following a collision on the A308 in Maidenhead. Clare Louise Smith and her daughter were involved in a tragic car accident on Wednesday 26 July. Clare was transferred to the John Radcliffe Hospital in Oxford and unfortunately passed away from her injuries on Sunday night. Her daughter will make a full recovery. Clare lived all of her life in Marlow and was a former pupil of Holy Trinity and Great Marlow Schools. In the past few year she had worked at Wycombe Hospital. She was very much loved by her devastated family and friends and will be forever sadly missed. A serious crash involving four vehicles in Hampshire has left a pensioner and a woman in her early 20s needing hospital treatment. Both were suffering from sustained shoulder, hip and back injuries after the crash. Four other people, including one child, sustained minor injuries and were treated at the scene. Two cars ended up off the road after the collision on the A35 north of Holmsley. Two ambulances, the air ambulance and a rapid response vehicle were sent to the scene yesterday afternoon. Footage has emerged of the alarming moment a four by four lost control while towing a trailer in Kent. 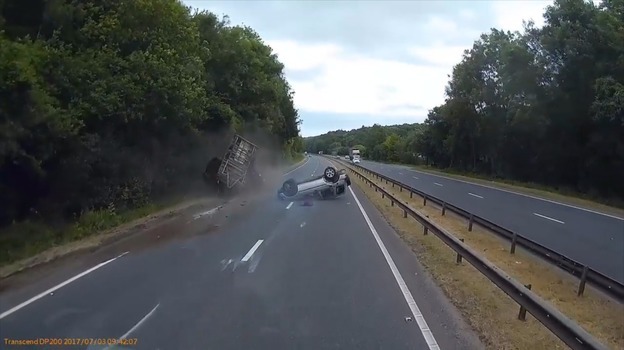 The video, posted on social media, shows a Land Rover Freelander skidding across two lanes and flipping over as it heads towards Maidstone on the A249. Motorists helped pull two occupants from the wreckage. Police say no one was seriously injured. A motorcyclist has been taken to hospital by air ambulance after a crash on the M3. Police officers were called to the southbound stretch of the motorway just past junction 4a, near to the Fleet services. Tributes have been paid to a man who died in a crash on Winkfield Road in Windsor. Koon Yau was a warm hearted person who worked extremely hard and cared very much for his family, in particular his mother. He will be remembered as a happy, friendly man. He was also a talented chef who was very popular with customers at the restaurant where he worked in Windsor. Koon Yau’s family and friends are shocked and saddened by his death and he will be very sorely missed. Two men have died after the light aircraft they were in crashed into a field in Wiltshire last night. It crashed at around 6.30pm in Brimslade, Marlborough. Emergency officials including police, ambulance and the fire and rescue service are at the scene. Representatives from the Air Accidents Investigation Branch are also present and will lead the investigation into the incident.